I am a big fan of cupboards they add instant personality to a space. My trick is to take off the doors as this creates a super casual vibe, relaxed yet comfortable. I have a big old industrial rusty thing in my kitchen that houses all my crockery, glasses and vases and am now considering something similar for the bathroom. 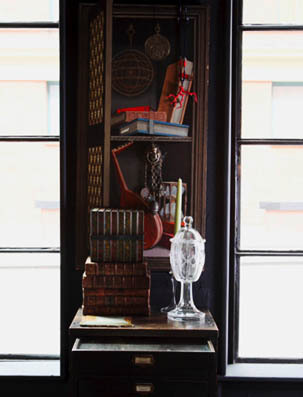 The key however with this open storage is to dress the shelves beautifullyÂ with things you love of course butÂ arranged in aesthetically pleasing rhythms. Forgot rigid schemes if you can and go for a bit more of a relaxed approachÂ its harder to achieve but the effect is far more interesting. This little beauty adds instant flair to the wall and whilst the doors haven’t been taken off left casually open they add that perfect degree of laid back luxe. 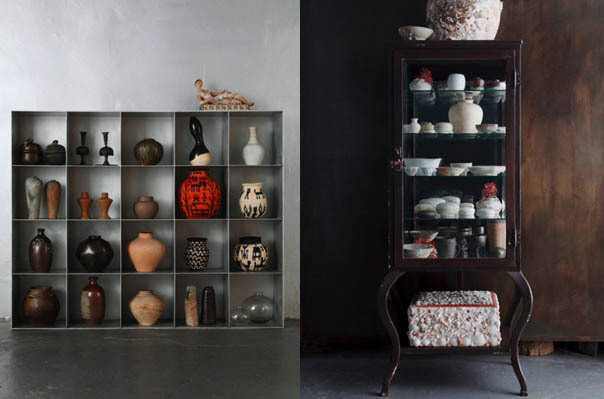 Here’s what to do in order to order to diminish disjointed and out of kilter shelves – think about how your eye flows from one object to the next and have lots of negative space – this allows groupings and stand alone objects to breathe. Then figure out your mood do you want a serene feel in which case all objects should be similar in size and equally placed or a more energetic tone. I am of course wanting the latter and often times mix up my arrangements with unusal shapes and bold hues. More displays to tantalize – they work because in both cases they are not adhering to any one style instead its all in the mix. Vibrant yet balanced is the way to go.